Sited in the Atlantic Ocean, the Uists form part of the Western Isles (Outer Hebrides), a remote archipelago of small inhabited islands off the NW coast of Scotland. Influenced by an oceanic climate, the topography and soils vary across the islands producing a mosaic of unique habitats which supports a rich assemblage of species. In the summer months, these islands come alive with vibrant colours and sounds. Along the western coast wildflower hay meadows support the insistent call of the corncrake, merging with the cultivated fields and arable plants such as corn marigold, also home to corn bunting and twite, whilst inland the orange bog asphodel of the blanket bog stands out against the purple heather moorland of the uplands. 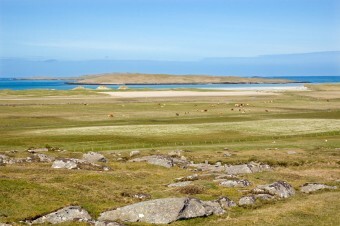 Machair, is a rare calcareous/sandy grassland habitat found nowhere else in the world except western Scotland & western Ireland, but its survival and the wildlife that depends on this special habitat is reliant on the traditional system of crofting— the low intensity grazing of cattle and sheep, along with some rotational cropping/fallow grown for fodder. For centuries crofters have lived and worked this remote landscape, sympathetically managing a small holding known as a ‘croft’, often combined with a share of moorland grazing in the hills held in common with other crofters in a township. As crofts have been passed on through generations, so too have the practices and traditional skills. Once quite a labour intensive operation involving families and communities working the fields ploughing, harvesting and hay cutting, nowadays most crofters work part-time on the croft having to take on other work to supplement their income as crofting is no longer financially viable. The number of ‘active’ crofters has halved since the 1970s, partly due to an ageing crofting population but also through the introduction of mechanisation and amalgamation of crofts into larger units.Local farming practices are changing – ‘black-baling’ early cutting of silage is increasing, whilst the ‘in bye’ land is under threat of intensification by the application of artificial fertilizers, less grazing in the uplands, loss of rural skills such as shepherding and the separation of farming enterprises between low lying and hill ground means that grazing is not being managed as a whole unit, combined these changes will have an impact on the biodiversity that thrives on these islands. 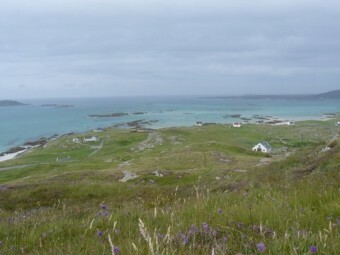 Since 2010, the Machair LIFE+ project has been working with crofting communities, agencies and partners to demonstrate the importance of the ‘machair’ and ensure that crofting has a sustainable future on these islands. Chrissie lives on her croft in Drimsdale, South Uist, where she is also the Township Grazings Clerk. 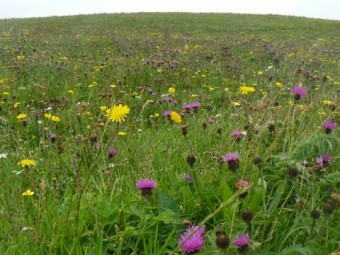 Chrissie farms 4ha of machair share, 17.87ha of in-bye land and also has common grazing rights. 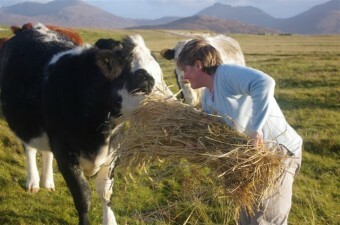 She keeps a mixture of simmental, angus/highland and shorthorn cattle and has a share in the Drimsdale sheep stock club, who still use their hill-grazing on Beinn Choradail and Hecla (Thacla). Following at least 3 generations of crofters, Chrissie is used to the hard work involved, but wouldn’t have it any other way. The Machair LIFE+ project has helped providing Chrissie with access to a reaper/binder machine to encourage traditional corn harvesting of ‘stooks & stacks’ and this year some of the corn was harvesting in the traditional way. The project has also helped with the seaweed collection and spreading, showing Chrissie how to work the machinery in order that she can do it herself, however “The thing with seaweed nowadays is that you’ve got the costing in of the fuel. 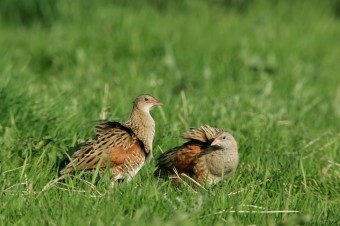 You’ve got to weigh it up, whether it’s just as cheap to put fertiliser on the ground …”.